Peonies are actually one of my favourite flowers, the other being tulips. 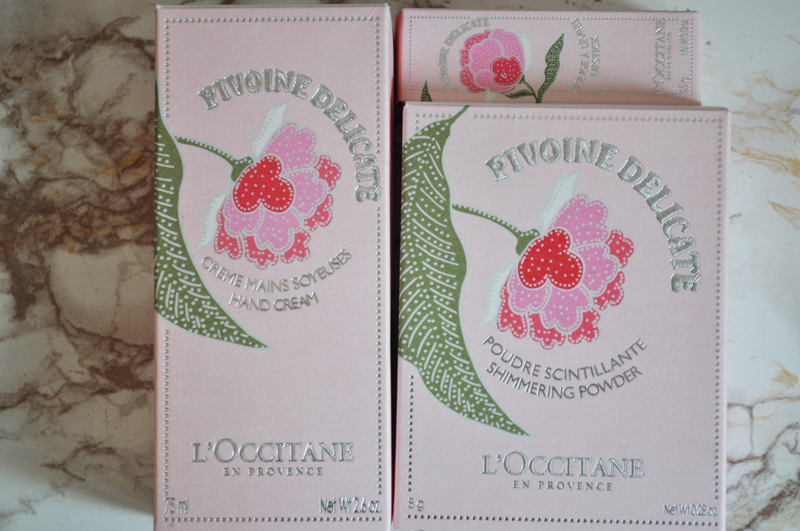 So this collection from L'Occitane is perfect for me. After the success of the Pivoine Flora perfume last year they have come out with a limited edition collection, Pivoine Delicate. I have three products from the collection but there's also an eau de toilette, fresh mist and lip glosses. I'm not usually one to keep the packaging of products but I think I'll have to with these. How beautiful are they?! I love the peony and could see it working really well as a print in a frame. 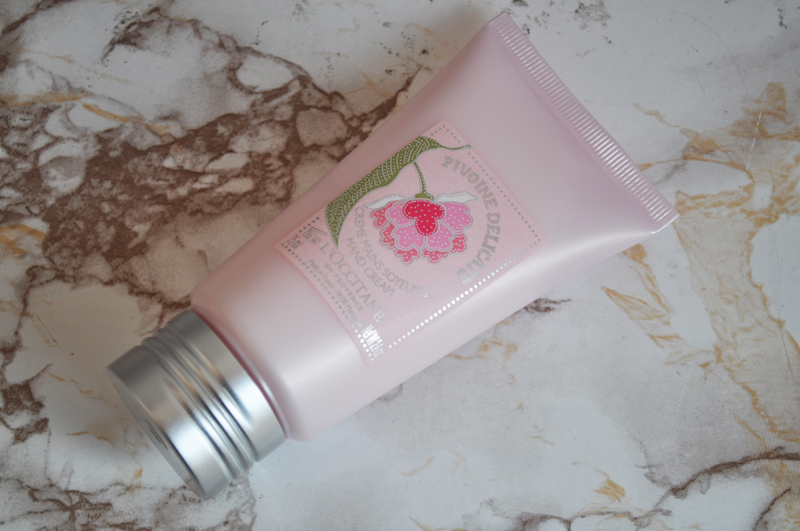 It's incredibly moisturising and leaves your hands feeling silky smooth. It isn't greasy at all and you can carry on with whatever your doing as soon as you apply it. The cream is 75ml so is small enough to keep in your bag and costs £14. This would also look great sitting on your bedside table which is where I've been keeping mine. 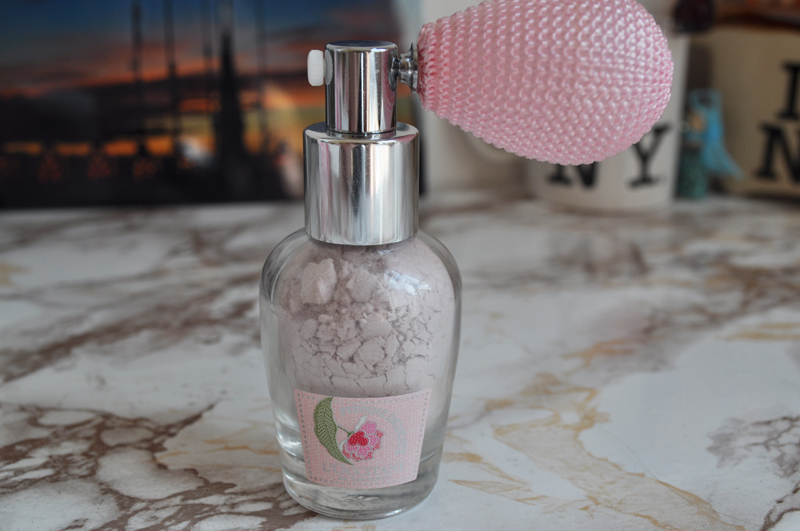 First, how gorgeous is the packaging for the Shimmering Powder*?! This would look perfect on your dressing table or bedside table as well. It can be used in your hair or on the body and leaves a pink and silver iridescent behind. The shimmer is very finely milled. I really like it in my hair and would never have thought to use it this way. I have fairly light hair so it's quite subtle, those with darker hair I'd imagine it would stand out more. This is probably the only product from the collection I wouldn't necessarily buy for myself but I think it would make a great gift. It costs £22 but I'd imagine it would last for ever! 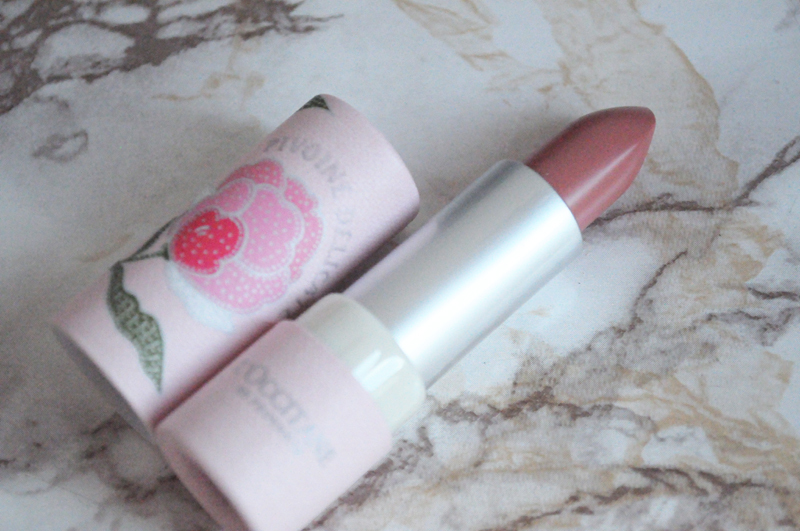 The Pivoine Delicate lipstick* is my favourite product out of the three. The packaging is amazing, by far my favourite for a lipstick. The colour is lovely too, very similar to 17's Beehive but just slightly more peach. It's also similar to Beehive in terms of formula. 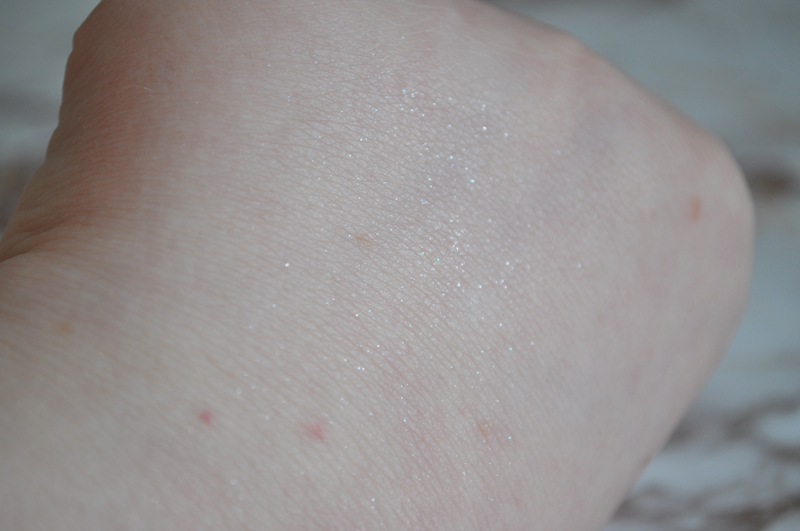 It's really moisturising and actually lasts a surprising amount of time considering it's quite sheer. There's silver sparkle in the bullet but this doesn't transfer to the lips. Because of how balm-like it is, it leaves your lips looking glossy. The lipstick is £12.50. 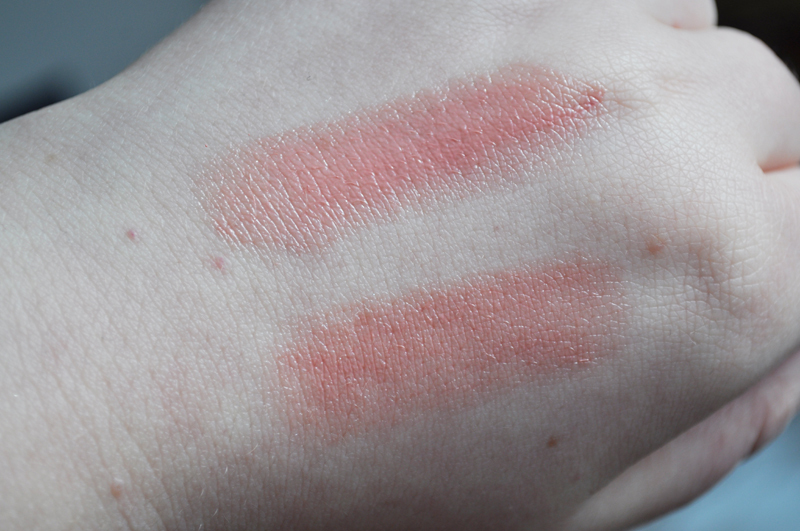 The swatch below is a comparison of the two lipsticks. 17 Beehive is the top swatch and Pivoine Delicate is the bottom. 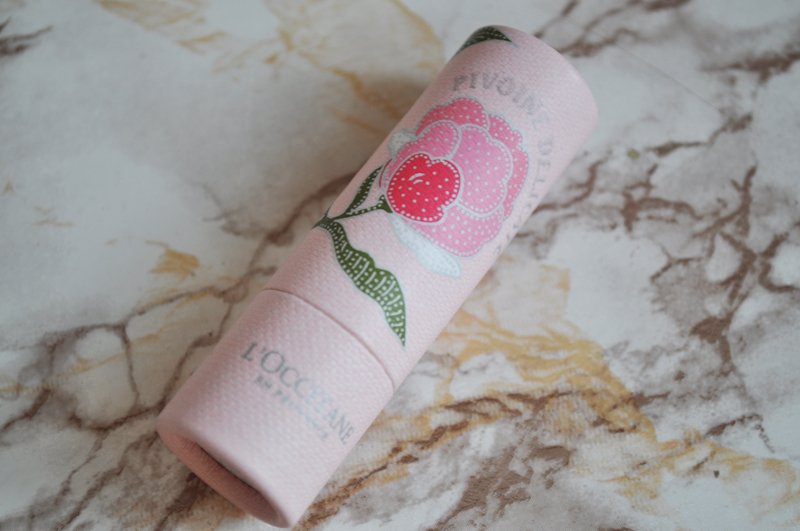 I have a mini bottle of the original Pivoine scent which came with a LatestInBeauty box. It has top notes of bergamot blended with grapefruit. Middle notes of intense peony, magnolia and violet petals and a base note of a lingering silky richness enveloped in vanilla, cedar and musk. 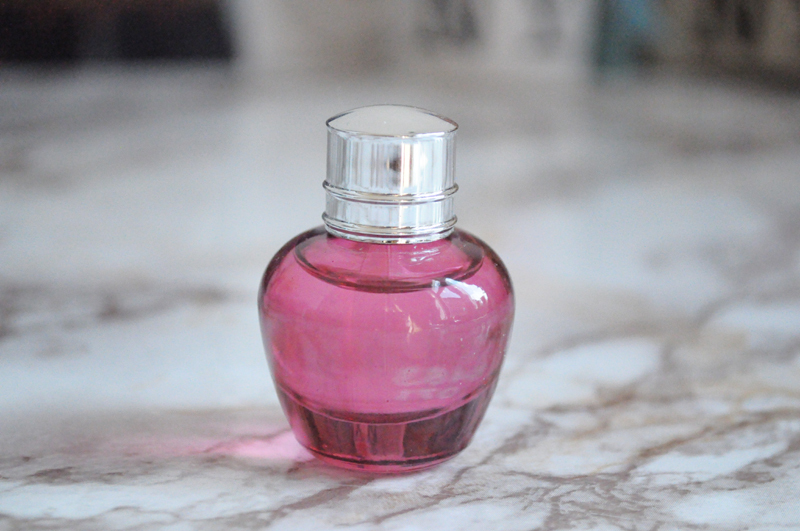 This 5ml bottle was available to buy on the L'Occitane website the other day for about £5 but it's not there anymore. It was limited edition so I'm not sure if this means it is currently sold out. The 50ml bottle is £40. I love peonies - how beautiful is that packaging? I would LOVE that shimmery powder, it's so glittery, you would look just like a unicorn! Haha.